Upali was a monk in the order of Siddhartha. Before joining the order, its interesting to note he worked as a barber. He was the first monk to be ordained by Buddha, and therefor wielded considerable power over kings and people of royal birth who came to join the order after him. 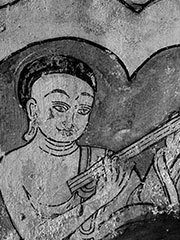 In the literature of every Buddhist school, Upali is depicted as an expert in monastic discipline and the monastic code. At the First Buddhist Council, he was asked to recite the Vinaya and monastic code. He attained the state of arhatship before his death, and is regarded as the ‘patron saint’ of monks who specialize in the Vinaya.